What’s funny is how OK with this I am! Case in point: my mom, knowing I had had a terrible day last week, sent me a surprise care package with one of my absolute favorite treats in the world: mini black and white cookies from a bakery near her office on Long Island. Black-and-whites, like bagels and pizza, scream HOME to me (new readers: I’m originally from northern NJ and am very much a NJ food snob!) So when I opened up the box at work Thursday and just swooned, staring into the depths of NJ/NY yumminess and wanting to GET.IN.MY.BELLY, STAT. They were, in a word, PERFECT. 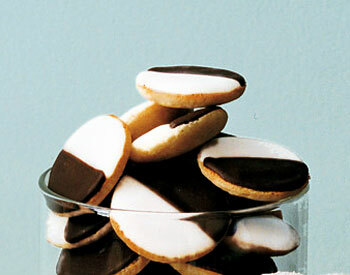 The kind of black-and-whites that aren’t too soft or hard, and have the perfect frosting-to-cookie ratio. Sweet but not sickeningly so. You could say I was in cookie heaven. I gave one to a friend, and then over the course of the next several days at work … ate three the first day, three the next and FIVE yesterday. Gulp. Yup, you heard me. FIVE cookies. Yes they were small, but still … five cookies is kind of ridiculous for anyone, no? Now I’ve noted that I’m still journaling my eats throughout my pregnancy, so it’s not like I wasn’t fully aware of what I was doing … even pregnant, I knew eating that many cookies today meant I’d need to be smarter tomorrow (note I didn’t say restrict or over-exercise — I said “be smarter’) … but at the time, I didn’t care. I wanted them and gave into my resistance muscle — that same muscle which, had it been flexed, would have stopped me at one, two, MAX previously. Do I recommend doing this every day? Of course not. They were a special treat … and I treated them as much. I didn’t mutilate them; didn’t throw them out; certainly didn’t chew and spit them. No, I savored them. And moved on. So why am I sharing this story today? Because I think as I’ve moved along this recovery path, milestones like this are worthy of mentioning. I’m not perfect and don’t pretend to be. I still struggle with emotional-eating and impulse eating; I’ve made that clear. And sure, for the same calories in five small cookies I could have had a lovely sit-down meal. But that isn’t what I wanted. And while instant gratification is not a positive trait to tout, at this point in my journey, being able to eat the cookies and savor them is worth much more to me than being able to say, “I stopped at one.” That might be the virtuous mentality, but it’s a dieter’s mentality. Not the mentality of someone who lives life to its fullest, which is really what I am ultimately striving for. And yes, I’m SURE that outlook is my pregnancy brain speaking and not formerly-restrictive-Melissa speaking. But right now, I’m listening to my pregnancy brain, which still mostly thinks in terms of moderation … though, as this story shows — not always! I guess what I’m ultimately learning is maybe I don’t need a resistance muscle at all, but rather that this more balanced approach towards food I’ve adapted the past year (including the past five months of pregnancy) is really the key to a life of enjoyment and pleasure? I mean, really … if most of your days are filled with moderation, then there’s really no harm in some indulgences, pregnancy state aside. The danger is in recognizing when I’ve had enough. And given the levels of actual fullness I’ve felt the past few days … I think I’m there! 😉 Still, the pleasure I got from enjoying those cookies (even out of moderation) was absolutely worth it. No, I wouldn’t repeat my cookie-fest tomorrow, but if my mom were to kindly send me another box next week, I’d probably just make them last a little longer. How about you? Do you find it easier or more acceptable at certain times to get lax with your resistance muscle? Do you think we even NEED one? Kim, I’m definitely beginning to agree with that!! All I know is that in the past few days I’ve had emotional eating creep in and I know its happening and its extremely upsetting. I do get lax but its so infrequent. I wish I felt comfortable enough to just give in. I would have loved one of those cookies! (But sweets are my emotional eating go-to). I’m sure my mom will send more and I’ll put one aside! There is nothing wrong with treating yourself every once and a while lol!